Well, a little: new results from the Lunar Reconnaissance Orbiter indicate that over recent geological time, the Moon has shrunk by approximately 100 meters in diameter! That image shows the Gregory scarp, a cliff across the surface of the Moon. Scarps like these have been known for centuries — I’ve observed many myself using a backyard telescope — but it was always thought they were big and restricted to just some areas on the Moon. 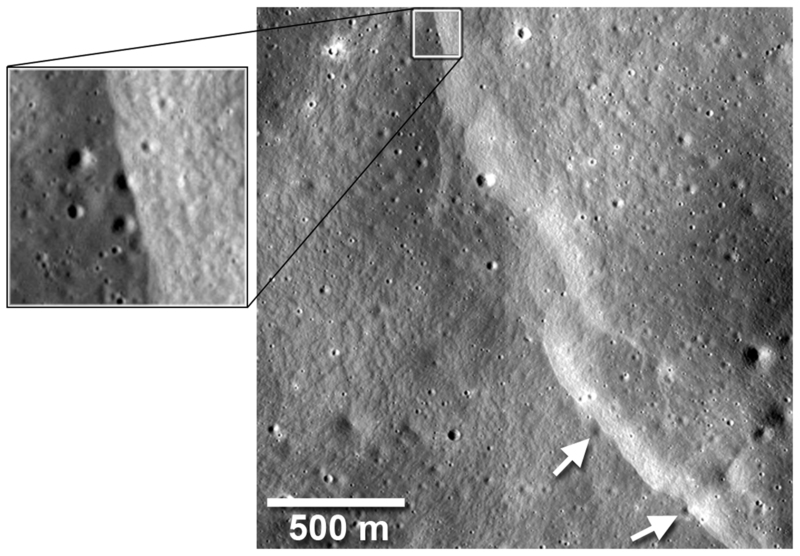 LRO, though has found many smaller scarps, and also importantly that these scarps are distributed globally, all across the surface of our nearest neighbor in space. What does this have to do with shrinkage? 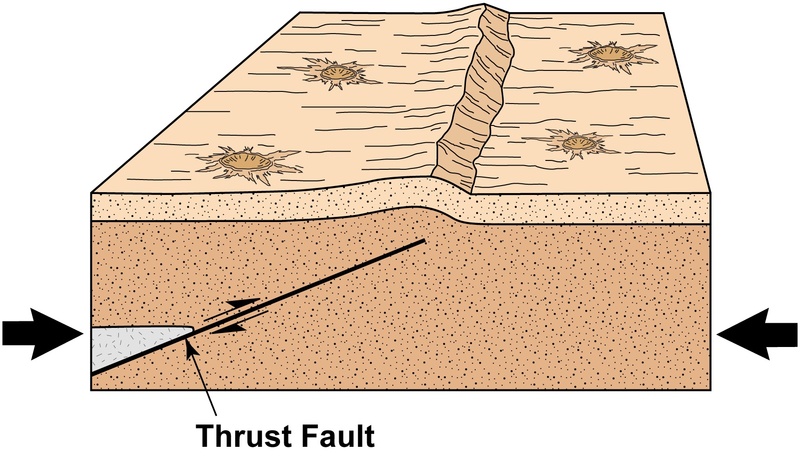 This diagram shows how scarps are formed: thrust faults. If the Moon shrinks, even a little, the surface shrinks too, and gets compressed. This causes stress under the surface, building pressure. Eventually that pressure exceeds the strength of the rock above it, and you get a fault. One side of the fault slams upward, forming the scarp. We see these sorts of features on many bodies in the solar system, including the Earth, where their origin is from tectonic plate motion. As the continental plates move past each other, friction allows the pressure to build up. There’s no such drift on the Moon — the surface is essentially one big piece — so something else must be causing it. Shrinkage makes the most sense. The interior of the Moon is still warm from the leftover heat from its formation billions of years ago. Hundreds of kilometers of rock makes a pretty good insulator, so the Moon has cooled very slowly. As the interior cools, it shrinks, and the surface collapses down as well. Pressure builds, then snap! While a lot of these scarps are very long and dozens of meters in height, LRO’s sharp vision (it can see objects less than a meter in size!) can spot scarps that are only a kilometer or two in length and a few meters high. That sort of feature is not possible to see from Earth. They’re too small. So this scarp formation has been going on essentially since the Moon formed, but the question is: does this process still continue today? 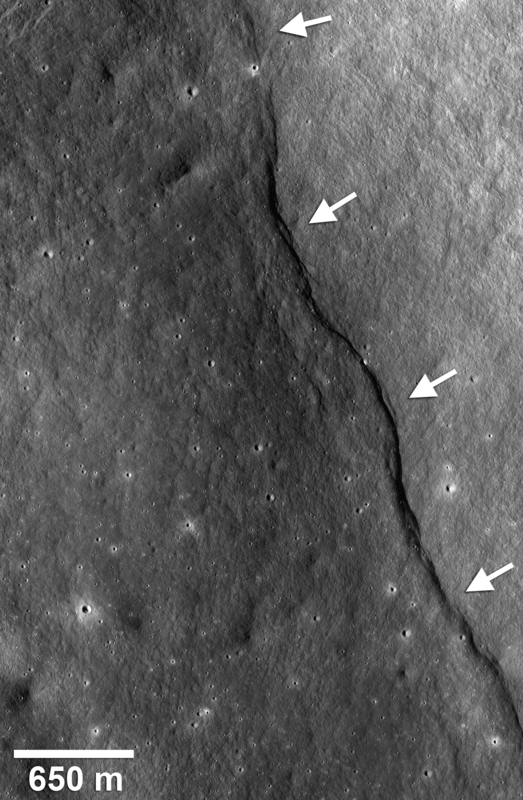 In this image, the scarp seen cuts right across some small craters. Geologists can use the number of craters to get an age for the landscape, which is how they have been able to get a rough estimate of how old the scarp is. Also, despite the lack of air and standing water, the Moon undergoes erosion. Solar wind, micrometeorites, and even the thermal expansion and compression caused by the Moon’s day/night cycle all work to grind up surface rock into dust. The scarps look quite fresh, limiting their age. Another interesting bit of evidence is that the Apollo missions put seismographs on the Moon, which recorded quite a few moonquakes. Several dozen of these quakes were shallow, which may be related to scarp formation (since the thrust faults are near the surface). So, does this mean the process is still going on? It’s not really possible to say as yet. A billion years is a long time, and it’s difficult to know if any small scarps are younger than that. As LRO scans more and more of the lunar surface, more of these types of landscape features will be seen. And finally, what does this mean for the ultimate size of the Moon? Well, you have to put this into perspective: the Moon’s diameter is about 3475 kilometers. This shrinkage is only about 0.003% of that. In other words, you’d never, ever be able to see that by comparing the Moon’s diameter now as it was, say, a billion years ago. So we’re not in any danger of the Moon collapsing down into a tiny little ball! What it does mean is that despite it being perhaps the most well-studied object in the sky, our Moon is still capable of surprising us. Not only that, but some of its secrets are actually rather big, but so well-hidden we need to study the Moon pretty carefully to uncover them. Happily, we’re doing just that. There’s not a scientist on the planet who doesn’t like surprises, especially when they’ve been sitting right there in the sky for us to find. – Lunar boulder hits a hole in one!